SMITHFIELD, Va., May 17 /CSRwire/ - Smithfield Foods, Inc. released the Food Safety and Quality section of its 2017 Sustainability Report, which provides robust information about the company’s leading approach to producing safe, high-quality products. This section focuses on programs and achievements that underscore a culture of food safety, and highlights new product offerings that reflect Smithfield’s transformation into a world-class consumer packaged goods and protein company. A revitalized food safety initiative that builds upon the company’s philosophy that all employees have a role to play in making safe, high-quality foods. Investments of more than $50 million in capital projects that enhance food safety and quality as well as production efficiency. Investment of $25 million in a new line of meal kits sold at retail stores to meet evolving consumer demands for complete meal solutions. Reformulated best-selling products with all-natural ingredients and the introduction of a new product category of fresh, never frozen, meatballs. The Food Safety and Quality section is the third of a multiphase release of Smithfield’s 2017 Sustainability Report, following Animal Care and Environment that were released earlier this month. Smithfield will publish its Helping Communities and People sections next week, along with the full report. 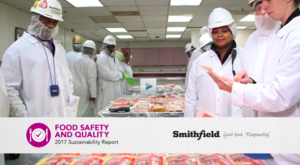 To view a video about Smithfield’s food safety and quality program, click here. To read the full Food Safety section of the report, please visit smithfieldfoods.com/foodsafety.